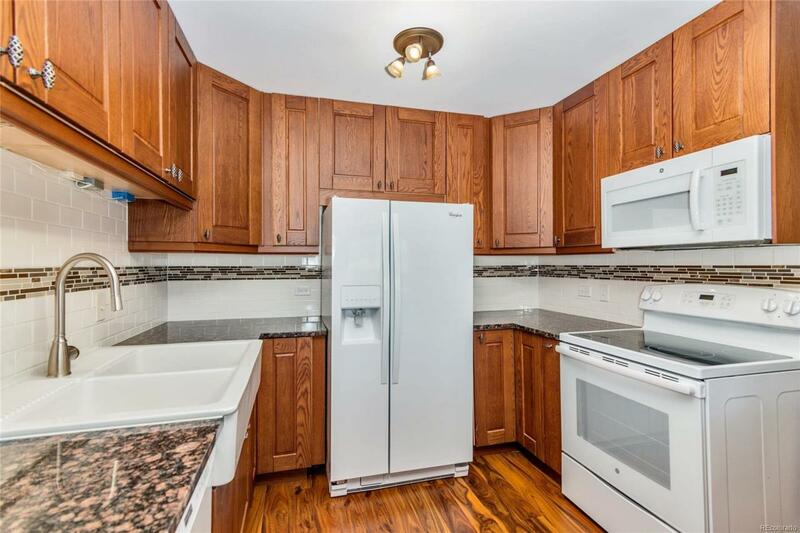 Updated Penthouse condo in Windsor Gardens! 1550 sf with 2 bedrooms, 2 bathrooms, and 2 car detached garages included! Kitchen features updated kitchen, lots of cabinetry with extra drawers and pantry, granite slab counterops, tile backsplash, and all white appliances stay. Bathrooms feature updated vanities, fixtures, and tile floors, master bathroom features 2 bowl sink. Wood laminate flooring throughout rest of condo. 3 wall a/c units. Glass/Screen/Tiled Enclosed Lanai! Newer vinyl slider door included meets HOA requirements. Bonus storage room on same floor. Denvers largest active adult living community, age 55+. FHA/VA approved community. Taxes are included in HOA monthly dues! And also includes heat, water, 24-hour patrolling community responder, club house w/indoor & outdoor pool, hot tub, sauna, 9 hole par 3 golf course, activities, restaurant, & more!